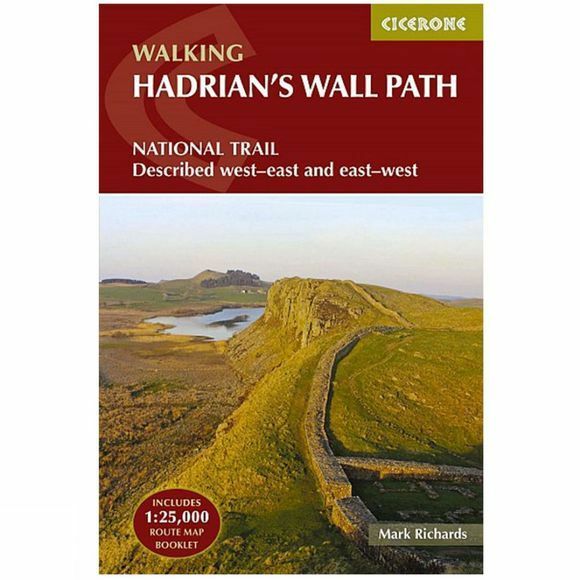 Guidebook and map booklet to walking the 84-mile Hadrian's Wall Path National Trail along the Roman Wall from Bowness-on-Solway to Wallsend, Newcastle. The trail typically takes a week to walk, and is suitable for beginners as well as walkers with greater experience. The route along Hadrian's Wall is described in both directions, and the guidebook also features extensions to Maryport on Cumbria's far west coast and South Shields in the east. Clear step-by-step route descriptions are illustrated by 1:100,000 OS map extracts. The guidebook comes with a convenient map booklet of 1:25,000 scale OS maps showing the full route. The route description links together with the map booklet at each stage along the way, and the compact format is conveniently sized for slipping into a jacket pocket or the top of a rucksack. (Note: the map booklet can also be purchased separately.) A wealth of information on the history of the Wall is included, as well as a wide range of practical information for walkers, from accommodation and itinerary planning, to details on public transport and refreshments.